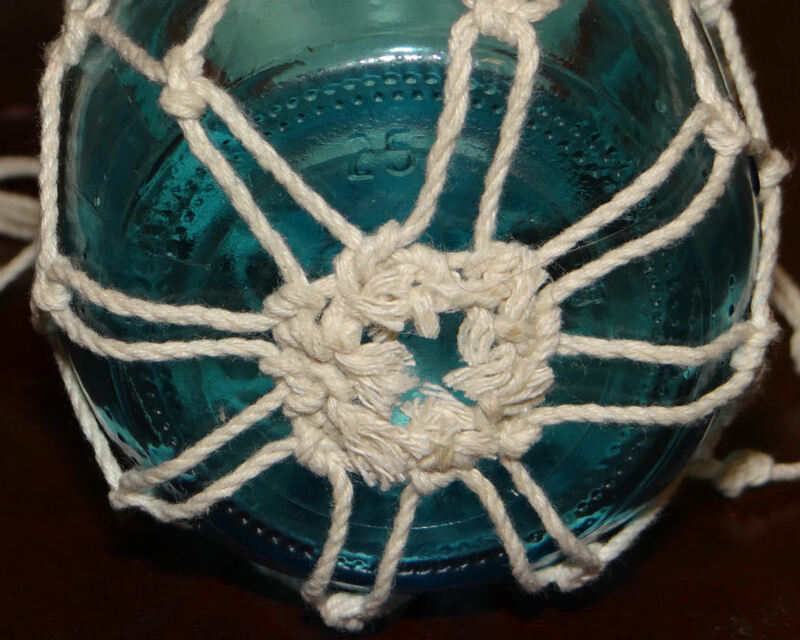 The jar lamp above was so simple to make, it only takes knowing three knots. The simple overhand knot that everyone uses, and how to tie a good square knot, and a lark's head. 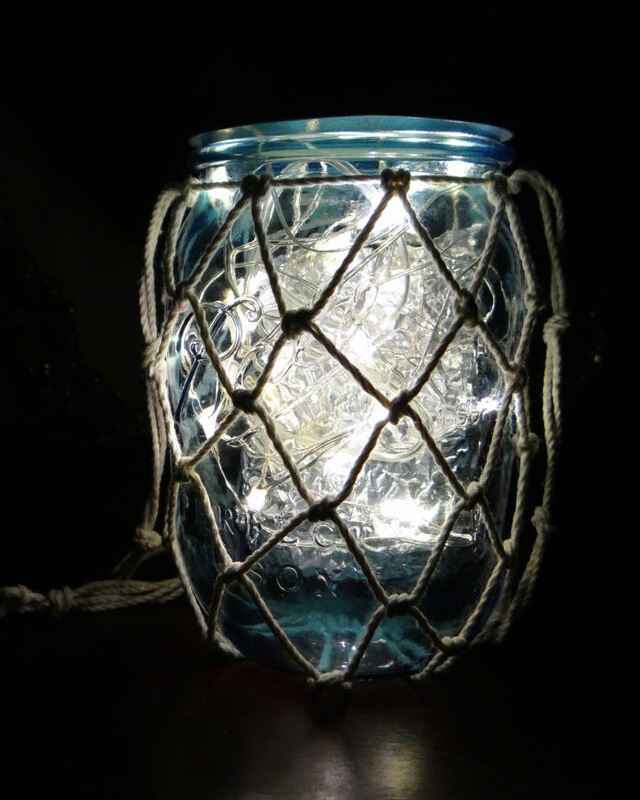 I use one of my Ball Heritage Blue jars for this, a strand of battery operated LED fairy lights, and inexpensive cotton cord from the local grocery store. The most expensive part is the strand of LED fairy lights at 10 dollars a strand, but they operate off of standard AA batteries so it's easy to swap out batteries. I also used aluminum foil to cover the battery case, and provide reflection. You can also use little LED tea lights. This is the kind of cord I used- you can find it at Menards, Fred Meyers, and hardware stores- but it doesn't have to be this kind, any kind of medium weight household twine will work. Don't use yarn, it's too stretchy. Cut 10 strands of cord 30 inches long- about an arms length from the center of your chest out to your finger tips if you don't want to measure! Then cut a piece that's about 14 inches long, fold the 10 long cords in half, and tie them in lark's head knots along the length of the 14 inch piece. Lark's head means you'll hold the loop on one side of the cord, then pass the ends around the cord through the loop and pull to tighten. 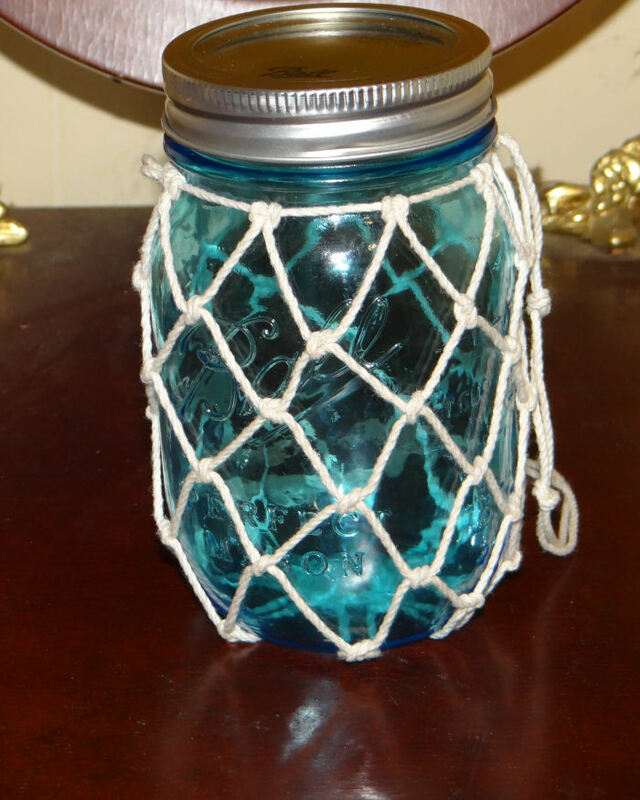 Take the lid and band off the jar, tie the 14 inch piece tight around the top of the jar under the threads, securing with a square knot. A good square knot is a strong knot, accidentally switching the orientation of one side of the knot makes a granny knot which isn't a good knot. So always remember, right over left and twist, left over right and twist. Count 3 cords out from both sides of the knot, arrange those so they are directly opposite each other and the same distance from the center knot.Tie those two sets of cords together for the hanger. Tuck them into the jar for the time being. Arrange the rest of the cords so they are spaced evenly around the jar, and take one right hand cord from pair, and a left hand cord from the cord pair to the left and tie a square knot about an inch down from the anchor cord. Repeat all the way around. If it helps to use a piece of cardboard to space them, do that. Keep repeating that around, until you've made a set of knots that's about an inch past the bottom of the jar. Now for the trickiest part. Except it's not really tricky. Knotting the bottom so it will be flat enough to put on a flat surface if you don't want to hang it. Please ignore the hair in the picture. I know better than snap these shots without putting my hair up first, but I was too excited about how good it looked with the fairy lights in it! Tie the right hand cord from one pair to the left hand cord of the next pair in a square knot that's directly under the last row of knots. Repeat around. Then do that again. Seal all the knots with a bit of glue and let the glue dry and trim the ends. If you are going with the same set of battery operated fairy lights I used, make a loose pouch of the foil to put the battery case in, and stuff the whole thing in the jar. You'll need to be able to get to the switch so make sure it's on the open end of the pouch. These are the lights I used- they also come in blue so The Amazing Turnip Girl is making a jar lamp for her room using the blue lights.